For Cyber Monday only, get $10 off your purchase of $50 or more when you pay with PayPal at The HomeDepot.ca. Offer not valid in-store or on kiosk orders. Offer excludes Gift Cards and with transactions paid by means other than through PayPal. Note: this offer is targeted. You need to receive an email from PayPal providing the Offer. 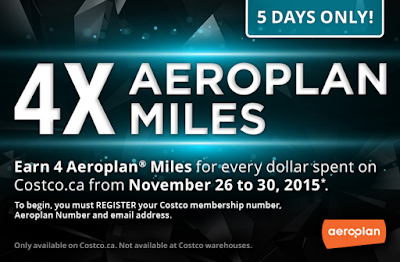 You can earn 4 Aeroplan miles for every dollar spent on costco.ca by Nov 30, 2015. Registration is needed. 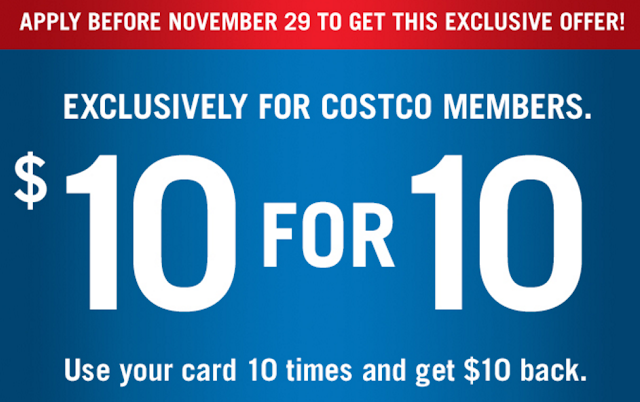 Note: Ineligible purchases include: new Costco memberships, Costco membership renewals, gift of membership, tires, Costco Cash Cards, custom installation services, travel and online digital print orders. Aeroplan Miles will not be awarded on cancelled or returned orders. Shoppers Drug Mart's "Spend Your Points Event" is back again. 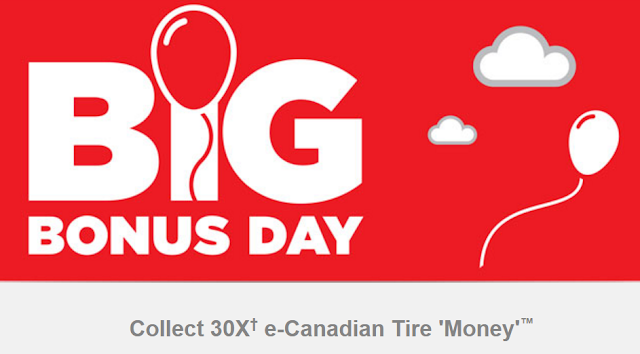 Normally, you can redeem 50,000 Shoppers Optimum points for $85 and redeem 95,000 Shoppers Optimum points for $170. But on Nov 28, you can get an extra $15/$30 worth of free stuff when you spend your Shoppers Optimum points. This event is always the best time to spend the Shoppers Optimum points. Share your referral link (above) with friends via email, social networks, and anywhere else you can think of. For each awesome referral, you will be able to send $400 through Plastiq without any fees. That means if your next payment is $400 or less, there will be no service fee, and any leftover credit will rollover to your next payment. If the payment is more than $400, a service fee will only be charged on the dollar amount over $400. Let's assume an average Plastiq service fee of 2%, then it means you can save $8 by one successful referral. These credits are called “fee-free dollars” and they’ll be saved to your account for future use. They don’t last forever, though – your balance will be reset to zero 90 days after the last time you used or earned them. Nov 26 is the Seniors' Bonus of Shoppers Drug Mart. Seniors can save 20% PLUS Receive a $10 Shoppers Drug Mart Bonus Card when you spend $50 or more on almost anything in-store that day. 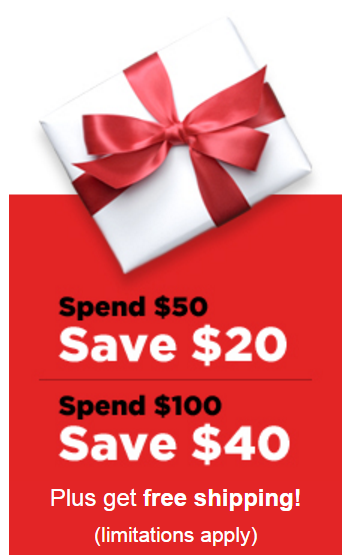 Note: the Shoppers Drug Mart Bonus Card is valid until December 17, 2015. 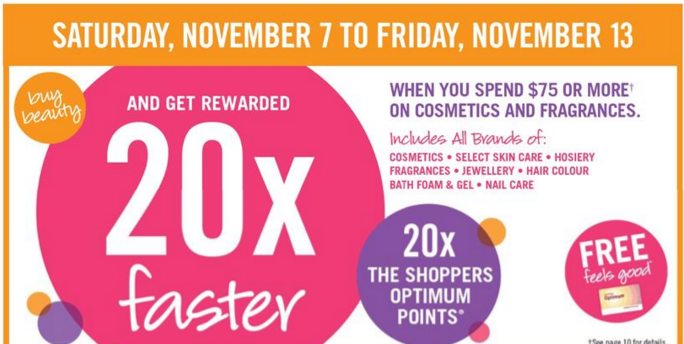 BTW, Nov 28, 2015 will be the SPEND THE POINTS Event (95000 points = $200; 50000 points = $100) of Shoppers Drug Mart. Just sign up and earn 2,500 Bonus Points on every stay of two nights or more at any US hotel in the Hilton Portfolio from December 1 through December 31, 2015. Registration is needed. You can get triple Choice Privileges Points on every stay at participating Choice Hotels Worldwide until Jan 15, 2016. Stay must be booked via ChoiceHotels.com, the Choice Hotels mobile app, or 800.4CHOICE at qualifying rates. Registration is required. Note: for this 8000 points, hotel reservations must be made on ChoiceHotels.com and completed by December 11, 2015. 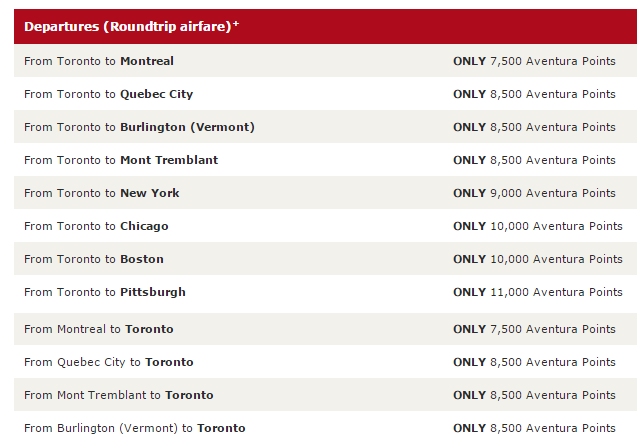 Both offers are for residents of the U.S. and Canada only. If you are an AmEx MR (Membership Rewards) member, you can get 25% more value in statement credits when you redeem points for TripFlex rewards until December 31, 2015. TripFlex rewards from MR gives you the freedom to book any travel using your American Express Card, then redeem your points to cover all or part of the charge – including taxes and fees too. You must redeem a minimum of 1,000 MR points and your statement credit cannot exceed the travel charge. Normally, you can redeem 1000 MR points for $10. With this new promotion, you can redeem 1000 MR points for $12.5. Note: You can redeem points for TripFlex rewards for a travel charge posted to your account in the past 12 months. You can earn 30X e-Canadian Tire Money at Mark's when you pay with your Canadian Tire Options MasterCard or Canadian Tire Options World MasterCard. Note: You can only use the earned CT Money in CT stores. 30X is not 30% return. That's actually 12% return. 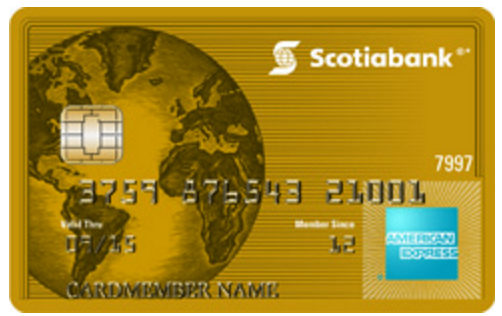 You can earn a bonus 40 PC points per dollar on your PC travel services purchase of any vacation with Transat Holidays, Nolitours or Air Canada Vacations until November 30, 2015, in addition to the regular 10 PC points per dollar earned for all purchases on your President’s Choice Financial Silver, World or World Elite MasterCard credit card. So, totally you can get 5% return from PC travel with this offer. Apply Capital One Platinum MasterCard before November 29, 2015, you can earn a $10 statement credit. Note: you need to have at least ten purchases post to your account by January 15, 2016. I still remember that you can get double bonus cash back for the first 3 month when this card was just available in the market. But, we may never see that offer back again. For RBC Avion cardholders, you can get 30% bonus when you convert your RBC Rewards points into BA Avios before December 15, 2015. As you may know that BA just devalued their North America short-haul flight. Now, RBC Avion also decreased the extra bonus level to 30% (it has been 50% bonus before). IMO, I will not recommend people to apply for the RBC Avion Visa Infinite since these 2 changes.